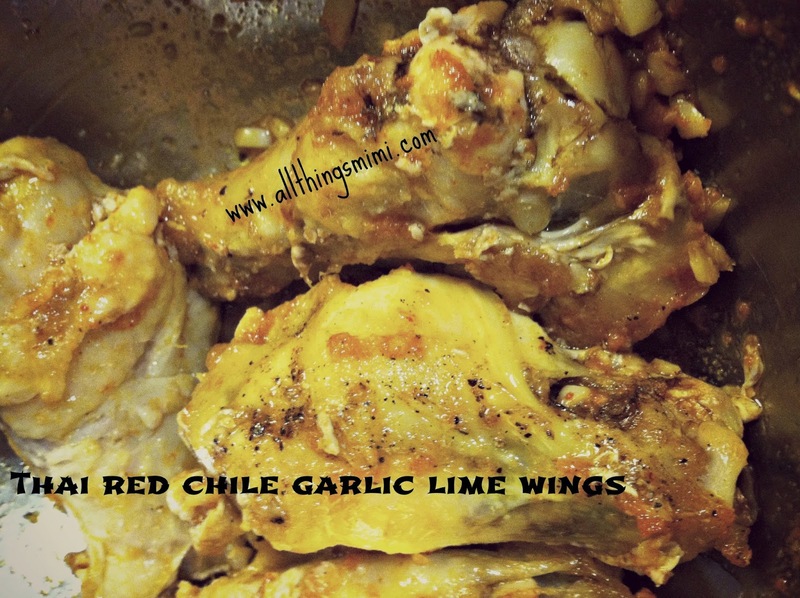 Thai Red Chile Garlic Lime Wings! How comes it seems like the best tasting food I make is always difficult to photograph? I love wings. My husband doesn't. So when he goes out of town, I always make sure I grab some at the store so I can gorge on them while he's gone. This was another one of those clean out the ice box deals. I bought a big bag of frozen wings at the grocery store. They were huge! I grabbed 4 of them and put them on a foil lined baking sheet and threw it in a 400 degree oven for about an hour. I didn't even defrost them! I did rub them with olive oil, salt and pepper before they went in, though. After about an hour I pulled them out of the oven and began contemplating what flavor I wanted to make them. I put about some olive oil in a skillet and grated about a tablespoon of fresh ginger in the oil. Then I minced about 5 cloves of garlic, zested a lime and dropped some Thai red chile paste in with it. I turned the heat on medium and let the oil and seasonings begin to sizzle. After about a minute, I put the wings in a bowl and tossed them with the seasoned oil. These were great! I think I'm going to pull a few more wings out of the bag and have these again tonight!